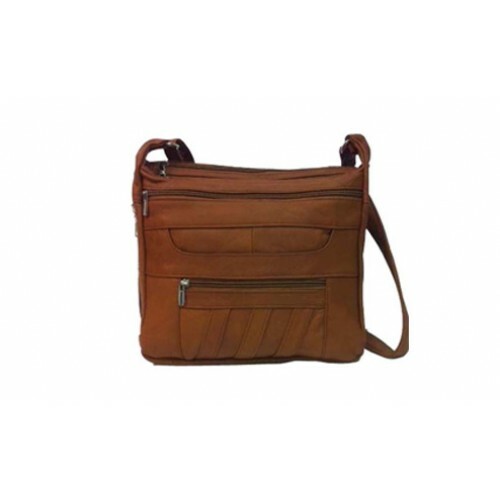 A very stylish and well-designed handbag is equipped with a long adjustable shoulder strap suitable for cross-body carry. Two large zipper openings in the top. The top zipper on the front of the purse opens to a full width and 3/4 deep compartment. The gun compartment is on the end and is closed by a lockable zipper. Below this zipper is a curved top slot pocket. 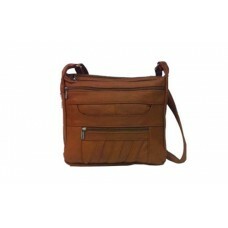 Below the slot pocket is a half length zipper compartment trimmed in lap-strake leather accent. Size : 12" x 9"